The brightest stars in the zodiac constellation Sagittarius form the shape of a teapot, complete with lid, handle, and spout. 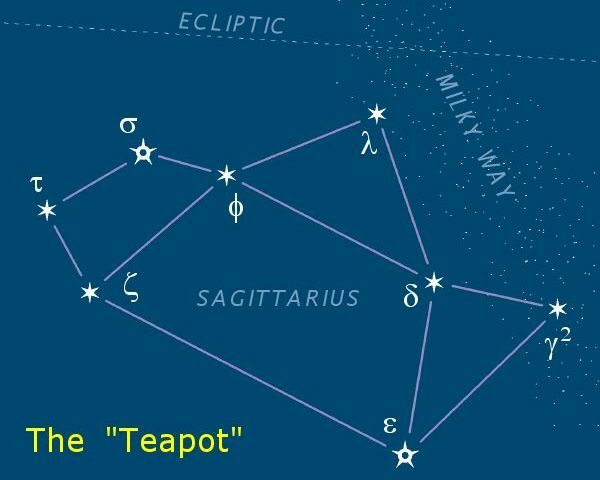 The plane of the Milky Way runs through Sagittarius, and just over the spout and lid of the teapot, making it look as if steam is rising from the spout of the teapot. The center of our Milky Way galaxy is in the direction of this starry steam. Boötes has a funny name. Pronounced boh-OH-deez, this constellation’s name means sheepherder, or herdsman. It looks kind of like a kite, or a shoe. Some remember that “Boötes look like a boot” to help pick it out in the sky. Corona Borealis, or “Northern Crown”, is a tiara-shaped, or C-shaped constellation. Its brightest star, called Alphecca, or Gemma, shines like the crown jewel centerpiece of a brilliant celestial tiara. It’s southern counterpart, Corona Australis, or “Southern Crown” lies just south of the ecliptic. Virgo’s brightest star Spica is found by following the curve of the handle of the Big Dipper (“arc to Arcturus, in Boötes, then spike to Spica”).The rest of the constellation isn’t particularly bright, but Virgo lies along the ecliptic—the plane of the Solar System, so bright planets pass through occasionally. M17, also known as the “Swan Nebula,” or the “Omega Nebula” is a vast cloud of gas—mostly hydrogen, in which clumps of gas are contracting to make new stars. The nebula is 15 light-years across, and 5,500 light-years away. M20, the “Trifid Nebula” gets its nickname from the dark dust lanes that seem to split it into three parts. It is a region of star formation—a giant cloud of gas, roughly 30 light-years across, and about 5,200 light-years away. M4 is a globular star cluster located near the bright, orange star Antares, in the constellation Scorpius. It is on the small side, as globular clusters go—only 70-75 light-years across. It is about 7,200 light-years away, which makes it possibly the closest globular cluster to our solar system. What we call “The Green Flash” is not so much a flash as a flicker of green color, seen on the top of the sun as it sets (or rises). This rare event needs just the right atmospheric conditions. Coma Berenices: “Berenice’s Hair,” a giant Y-shaped open star cluster. It is only 280 lightyears away and appears a bit east of Leo. Jupiter is the largest planet in the Solar System, a “gas giant” 11 Earth-diameters across. Its atmosphere contains the Great Red Spot, a long-lived storm 2-3 times the size of the Earth. The 4 large Galilean satellites and at least 63 smaller moons orbit Jupiter. The 2.1 Meter telescope has an 84″ primary mirror made of Pyrex, that weighs 3,000 lbs. The telescope became operational in 1964—one of the first operational reserach telescopes on the mountain. As part of the National Optical Astronomy Observatory (NOAO) for many decades, it is an important part of the history of the mountain, and has made many important contributions to astronomical research. Despite its significant role within the National Observatory, by 2015 the time came to pass the telescope on to new tenants, so NOAO could focus its efforts on its newer, more advanced telescopes. The Robo-AO team stepped in, and installed their state-of-the-art robotic adaptive optics system on the 2.1 Meter. Adaptive optics allows telescopes to nearly eliminate the distorting effects of the atmosphere, greatly increasing the resolution of the telescope. Thanks to its new tenants, suite of instruments, and the dark skies of Kitt Peak, the 2.1-meter continues to make important contributions to astronomical research. The WIYN Observatory is owned and operated by the WIYN Consortium, which consists of the University of Wisconsin, Indiana University, National Optical Astronomy Observatory (NOAO), the University of Missouri, and Purdue University. This partnership between public and private universities and NOAO was the first of its kind. The telescope incorporates many technological breakthroughs including active optics hardware on the back of the primary mirror, which shapes the mirror perfectly, ensuring the telescope is focused precisely. The small, lightweight dome is well ventilated to follow nighttime ambient temperature. Instruments attached to the telescope allow WIYN to gather data and capture vivid astronomical images routinely of sub-arc second quality. The total moving weight of the WIYN telescope and its instruments is 35 tons. WIYN has earned a reputation in particular for its excellent image quality that is now available over a wider field than ever before through the addition of the One Degree Imager optical camera. Originally, a 36 foot (11 meter) radio telescope resided in this dome. Built in 1967, the 36 Foot Telescope, as it was known, was a part of the National Radio Astronomy Observatory (NRAO). In 1984, it was replaced with a slightly larger dish, and the name was changed to the 12 Meter Telescope. In 2000, the NRAO passed control of the telescope to the University of Arizona. The University of Arizona had been operating the Submillimeter Telescope (SMT) located on Mount Graham since 1992. When it took over operations of the 12m, it created the Arizona Radio Observatory (ARO) which now runs both telescopes. In 2013, the telescope was replaced with ESO’s ALMA prototype antenna. The new dish is the same size, but has a much better surface accuracy (thereby permitting use at shorter wavelengths), and a more precise mount with better pointing accuracy. The 12m Radio Telescope is used to study molecules in space through the use of molecular spectroscopy at millimeter wavelengths. Many of the molecules that have been discovered in the interstellar medium were discovered by the 12m. Though the Calypso telescope and its 1.2 meter mirror have now been acquired by the Large Synoptic Survey Telescope team, it once occupied the large “garage on stilts” on the west side of the mountain. Edgar O. Smith, a businessman-turned-astrophysicist, designed Kitt Peak’s only privately owned telescope to create the sharpest possible images. The garage-like building rolls away on rails, leaving the telescope very exposed, and able to cool to ambient temperature. Its adaptive optics system can adjust 1,000 times per second to remove atmospheric blurring. Calypso will eventually be moved to Cerro Pachón in the Atacama Desert of Chile. The “garage on stilts” sits empty. The Very Long Baseline Array (VLBA) is a part of the Long Baseline Observatory (LBO). It consists of a single radio telescope made up of ten 25 meter dishes. The ten dishes are spread across the United States, from Hawaii to the Virgin Islands. One dish is located on Kitt Peak: The LBO Kitt Peak Station. Kitt Peak Station, along with the other dishes, work in unison to point at the same targets at the same time. The data is recorded and later combined. By spreading the dishes out over such a great distance, instead of building them all in the same place, a much higher resolution is gained. The Mayall 4 Meter Telescope was, at the time it was built, one of the largest telescopes in the world. Today, its mirror—which weighs 15 tons—is relatively small next to the mirrors of the world’s largest telescopes. Completed in the mid-’70s, the telescope is housed in an 18-story tall dome, which is designed to withstand hurricane force winds. A blue equatorial horseshoe mount helps the telescope point and track the sky. A new instrument called DESI (Dark Energy Spectroscopic Instrument) will soon be installed on the 4-meter. Once installed, DESI will take spectra of millions of the most distant galaxies and quasars, which astronomers will use to study the effect of dark energy on the expansion of the universe. The Mayall 4 Meter is named for Nicholas U. Mayall, a former director of Kitt Peak National Observatory who oversaw the building of the telescope. The Mc Math Pierce Solar Telescope is actually 3 telescopes-in-one. It was, at the time of its completion in the 1960s, the largest solar telescope in the world. It will remain the largest until the completion of the Daniel K. Inouye Solar Telescope (DKIST) in 2018. The Solar Telescope building looks like a large number 7 rotated onto its side. The vertical tower holds up 3 flat mirrors, which reflect sunlight down the diagonal shaft—a tunnel which extends 200 feet to the ground, and another 300 feet below ground, into the mountain. At the bottom of this tunnel are the three curved primary mirrors, which reflect the light of the Sun back up to about ground level, where the Sun comes into focus in the observing room. MDM Observatory is located on a lower ridge to the southwest of the main observatory campus. Its name comes from its original member universities—University of Michigan, Dartmouth and MIT. Current members of the observatory are University of Michigan, Dartmouth, Columbia, Ohio State University, and Ohio University. MDM consists of two telescopes—the McGraw Hill 1.3 meter and the Hiltner 2.4 meter. SARA stands for Southeastern Association for Research in Astronomy. Formed in 1989, SARA sought to form a mutually beneficial association of institutions of higher education in the southeastern United States which have relatively small departments of astronomy and physics. At the time, a 36″ telescope on Kitt Peak was being decommissioned by the National Observatory. The Observatory planned to award the telescope to new tenants who showed they could use the telescope well. SARA’s proposal for use of the telescope was selected out of about 30. Today, SARA operates the 0.9 meter telescope of Kitt Peak, as well as a 0.6 meter telescope at Cerro Tololo in Chile. Both telescopes can, and are mostly used remotely. The Robotically-Controlled Telescope (RCT) is a 1.3-meter telescope on a German equatorial mount. The RCT occupies the dome across from the Kitt Peak Visitor Center. The long building attached to the RCT dome is the Kitt Peak administration building. The RCT name originally stood for Remotely-Controlled Telescope, and it served the KPNO user community almost 30 years before being closed in 1995. The telescope was originally proposed by the Space Sciences Division at KPNO as the Remote Control Telescope System (RCTS) to be an engineering research platform for the development of remote control protocols for envisioned orbital telescopes. In later years, the telescope was used to test out various instrumentation that was later used on the larger 2.1-meter and 4-meter telescopes of Kitt Peak. In 2004 The RCT Consortium began operating the telescope as its new tenants. Today, the telescope is mostly used either remotely, with observers operating the telescope via the internet, or robotically, with the telescope opening and observing automatically, using its programming to determine what to observe based on scheduling and observing conditions.